A new week, means we’re back to the grind. Only our grind here at The Reel Place consists of telling you about the upcoming movies you can expect to see hit the theaters during this Fall and Winter. We’ve already covered what we’re going to be seeing from Lionsgate, Universal, and Summit Entertainment. This Sneak Peek segment will cover what we will be seeing from Disney (which includes Disney subsidiaries Touchstone and Miramax) in the coming month. I for one am excited for a few of the films on this list. The trailer of Tron: Legacy is already making me drool, but we’ll get to that a little later on. You Again – Sure to be a favorite among the 18 – 30 female crowd, You Again stars Kristen Bell (Mami) and Odette Yustman (Joanna) as bitter high school rivals that must learn to get along because Joanna is marrying Mami’s brother. To make matters worse Joanna’s aunt (Sigourney Weaver) and Mami’s mother (Jamie Lee Curtis) are flying in to help with the wedding. Wouldn’t you know it, their arch rivals too! I really can’t say I’m excited for this movie. It does have a couple bright spots though in Betty White and Kristin Chenowith. We’ll see. It seems like one of those films that you can tell the beginning, middle, and end just by watching the trailer. Plenty of cat fights, all the way up to the lovey-dovey ending where everyone realizes how silly they’ve been acting and become the best of friends. Secretariat – You have no idea how long I’ve been waiting for a Seabiscuit sequel. Ok, maybe it’s not the same story, but you get the idea. If you saw Seabiscuit and the story of a horse that overcomes all odds to become a hero, then you know what you’re in for. I hate to admit it, but Seabisuit made me tear up a couple times. There’s just something about horse-filled drama that has a straight connection to my heart. Secretariat is the “based on true story” of the famous horse that went on to (spoiler warning!) win the Triple Crown. Tangled – Even though Disney returned to form and brought back its heralded hand-drawn animation with The Princess and the Frog, they are continuing on with their non-Pixar CG animated features (ala Bolt). I loved Bolt, so I’m excited to see Tangled. I’m a Disney nut, so you may want to take what I say knowing that I’m saying it with a tad bit of bias, but the trailer looks good. 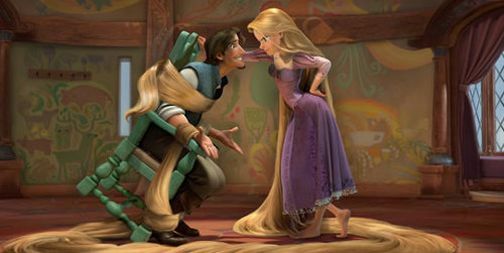 Tangled is the Disney-fied version of the Rapunzel story about the girl with the longest locks in fairy tale history, who is locked away in a tower waiting to be rescued by her one true love. It looks like a lot of fun, with a heavy helping of the Disney trademark spirit we’ve come to know and love. The Tempest – This is the only film on this list that I had no idea existed until I got the press release from Disney in my inbox about these upcoming films. Directed by Julie Taymor who helmed the richly visual masterpiece Across the Universe, starring Russell Brand and Helen Mirren, The Tempest is a retelling of Shakespeare’s play of the same name. Only this time there’s a twist, instead of Sorcerer Prospero, instead it’s Sorceress Prospera (Mirren). Russell Brand in a Shakespeare adaption? Now I’ve heard of everything. I have no idea what to think about this film other than I’m excited to see it because of the kind of potential it holds. TRON: Legacy – Here we are at the end of Disney’s slate of films, which promises to be an unforgettable movie event. I would say that the original TRON film came before its time when special effects weren’t up to what its world was trying to convey. When revisiting the old TRON it’s easy to see that it hasn’t aged quite well, but with this sequel looming on the horizon TRON will finally get the special effect treatment it deserves. Oh, and Jeff Bridges gets a digital scrubbing that makes him look younger and more vibrant than he looked in the original. The fanboy in me can’t resist loving this film already based solely on the trailers and nifty still images that have been released. The movie critic in me is still out until I see it, but needless to say the anticipation is killing me. As always let us know in the comments what movies you’re excited to see from Disney as the Fall and Winter months roll in.